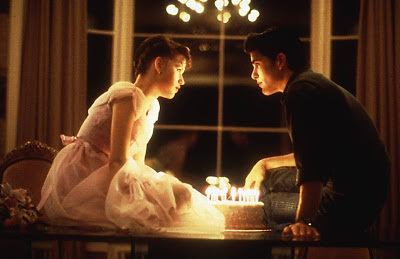 With the Oscars being held earlier tonight, I have to admit that I completely forgot other movies existed this weekend and never even came close to getting out to the movie theater. Yes, the Oscars only took place on one night, but for all of us who write for this blog, they're such an event that even just preparing for them takes up your full weekend (plus there was NBA All-Star stuff going on too, and I had to catch some of that). Anyway, as I'm looking over this weekend's takes, not much stands out. As you can see from the heading, "Act of Valor" topped them all, and really pulled away from the rest of the pack. Tyler Perry's newest feature, "Good Deeds" (which admittedly, I missed talking about in last week's 'New in Theaters' post) came in second, and yet again, the big surprise of the weekend was "Journey 2: The Mysterious Island", which came in third and had by far the lowest drop-off of any other film that's been out for at least three weeks. The other two new releases this weekend, "Wanderlust" and "Gone" did much worse, and barely made the top 10. Check out all of the numbers after the break. 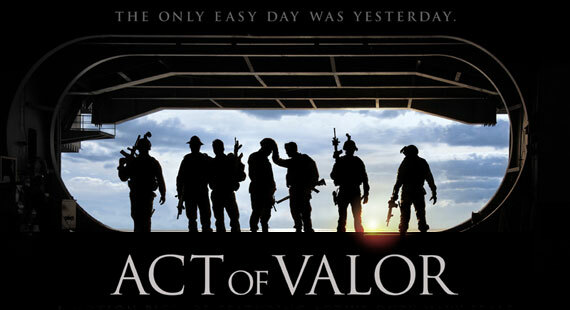 As I mentioned above, "Act of Valor" was the big winner this weekend. It took in a projected $24.7MM, already doubling it's production budget of $12MM. This is probably right about what I would have expected. This was an incredibly weak field, and someone had to bring in money. Tyler Perry's newest installment, "Good Deeds", brought in $16MM and just barely rose above the clump of movies in the 2-5 slots that all made about the same amount this weekend. This is a pretty standard take for a Tyler Perry movie, and I'm sure it'll have pretty good legs for the next couple of weeks. Rounding out the top 5, Journey 2 made almost $13.5MM and continues to put up strong numbers. I terribly underestimated this film! It's already made over $76MM and is now only $3MM away from making back its budget - something that three weeks ago I was sure was not going to happen. 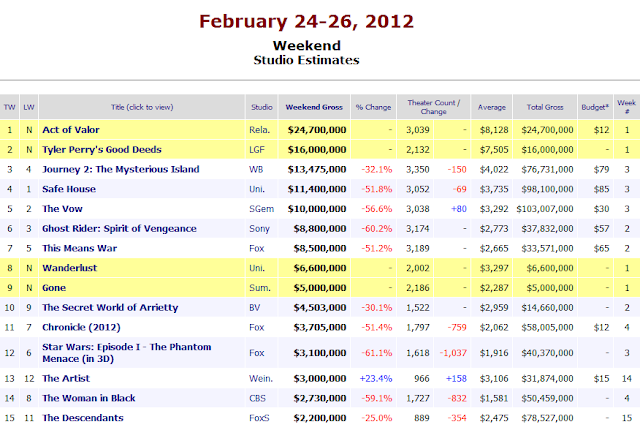 "Safe House" was fourth with $11MM, and "The Vow" was fifth with $10MM. "Wanderlust" and "Gone" were the only other wide-releases this weekend and came in in the eighth and ninth spots, taking in $6.6MM and $5MM, respectively. I'm not sure what the hopes were for these two movies, but surely this wasn't it. "Wanderlust" is an indie-comedy, the type of film that traditionally never plays well in theaters, so that wasn't much of a surprise to me. "Gone" was probably hoping for quite a bit more though. so i guess we can predict a bump for the artist next weekend? I would imagine so. 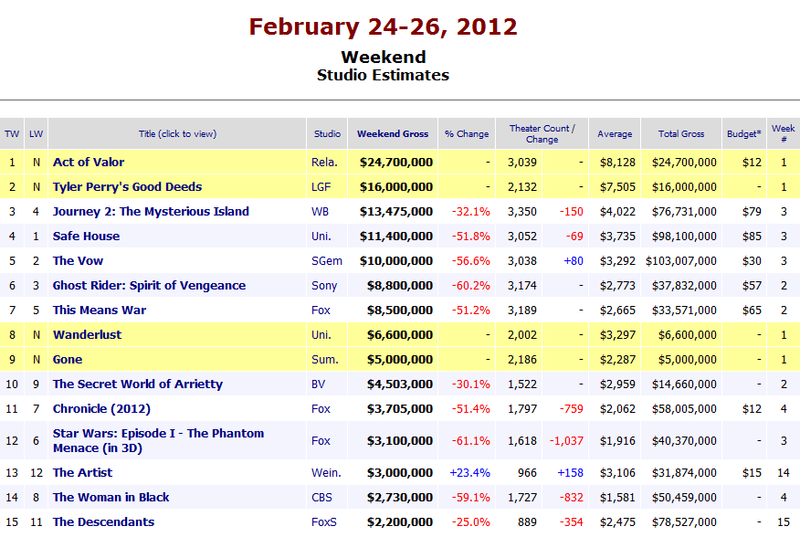 It even jumped up a little bit this weekend - only film in the top 15 to actually do better than its week before.